There’s nothing like a home-grown tomato. My daughter and her husband live on a ranchette outside of Houston. She is discovering the glories and the challenges of summer gardening. So last Friday, as we said goodbye after lunch at Spanish Flowers Mexican Restaurant, she handed me a large bag full of tomatoes, freshly picked that morning from her very own garden. She’s already overrun with tomatoes, it seems, and the zucchini, summer squash, and peppers are coming on strong. It won’t be long for those bumper crops to arrive too. I’m happy to take some surplus off her hands! As if anticipating a comment like, “What will I do with all these tomatoes?” my daughter also gave me a recipe for a wonderful tomato basil soup, a favorite of ours. The recipe requires that the tomatoes be peeled, cored, and seeded. Time was that I might have skipped the peeling, because of prior bad results. To me, peeling a tomato can be as tedious as stripping old wallpaper, or perhaps chipping off nail polish. However, there’s a really easy way to do it, and the recipe reminded me of it. Here’s what you do. Get a big bowl, I mean a big one, and fill it with cold water and ice. Then, put a fairly deep saucepan almost full of water on the stove, and bring it to a good simmer. Take a tomato and a paring knife, and cut a small X on the bottom of the tomato. 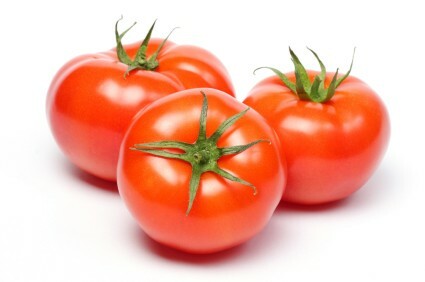 Gently place the tomato in the boiling water for just 20-30 seconds. Fish it out with a slotted spoon, and then quickly put the tomato into the ice water bath. You can do 2 or 3 tomatoes at a time, depending on how big your pot is. When you take each tomato out of the ice water, chances are the peel will begin to slip off easily right in your hand. Otherwise, look at the X on the bottom, and the peel there will have begun to curl. You can easily get your knife in there and the peel comes right off. This technique is called parboiling, and it gets the peel off without actually cooking the tomato. I thought about how sometimes learning makes you feel like a tomato. Learning always changes the learner, because afterwards you can do something you couldn’t do before. It can seem a little daunting, to be asked to change. You might have to give up your “skin,” or your habitual way of doing things. The process might seem like boiling water, or an ice bath. Non-habitual actions get your attention and shake you up a bit, but not enough to cook you. But then, the old habit peels right off, and you’re tasty, fresh, and ready to be useful, even nourishing to others. The soup was delicious! The Feldenkrais Method, at its heart, is a method of learning, and the method can be used to learn anything. It’s about discovering possibilities that our habitual patterns don’t let us experience. Anything can be easy, once you know how–whether it’s moving without pain, recovering from an injury, or improving an athletic or artistic performance. The work has transformational potential, as “the impossible becomes possible; the possible, easy; and the easy, elegant.” Just like peeling that tomato.